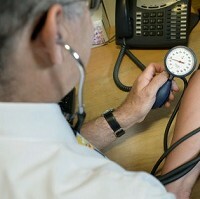 The risk of developing diabetes is much greater among people with high blood pressure, a new study has found. Researchers at Oxford University studied data from more than four million people, finding that those with raised blood pressure are nearly 60% likelier to develop the disease than those with normal levels. And they are now calling for more research to be carried out to assess whether blood pressure-lowering medications could be used as a tool to prevent cases of Type 2 diabetes. Around the world, diabetes affects over 400 million people, with diabetics - who can cover themselves while on holiday with a diabetes travel insurance policy - having a raised risk of heart attacks, heart failure and strokes. At the beginning of the research, everyone whose data was studied was free of both diabetes and cardiovascular disease. But those who had high blood pressure had a close to 60% greater risk of getting diabetes than those who did not. The link was found in both men and women, among people of different ages and in those whose weight was normal, as well as those who were overweight or obese. Professor Kazem Rahimi, deputy director of Oxford University's George Institute for Global Health UK, says the study's findings could be a "game changer" when it comes to treating and understanding diabetes. The expert says that with the research showing that people with high blood pressure have a significantly higher risk of developing diabetes, it should provide patients and doctors with an even greater motivation for bringing it under control. Professor Rahimi says although the link has now been established, it is still not known whether high blood pressure actually causes diabetes or is just a risk factor. But he says the study has paved the way for researchers to look at whether the risk of developing diabetes could be cut by lowering patients' blood pressure. The team's study has been published in the Journal of the American College of Cardiology.